The Federal Aviation Administration (FAA) this week issued the first Letters of Authorization for universities to make their graduates eligible for an airline pilot certificate under FAR 61.160. 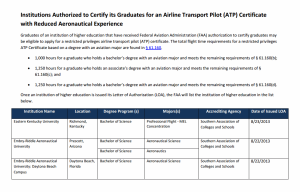 These three universities can now officially certify graduates as qualifying for a restricted privileges airline transport pilot (R-ATP) check ride. Without such certification, pilots are required to meet a new minimum experience level of 1,500 flight hours before working at an airline.